Today is Halloween. 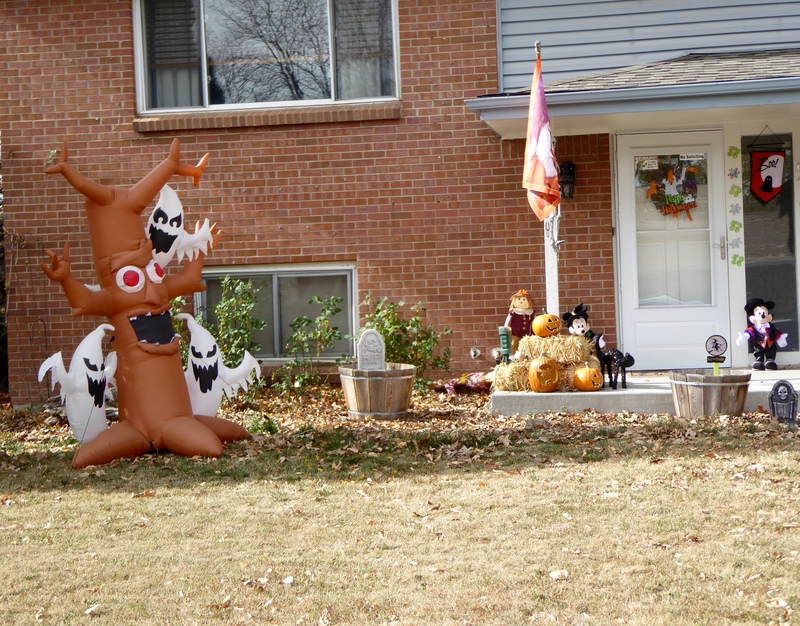 Our neighborhood has many Halloween decorations. Some are friendly and some are really spooky. We like this house. 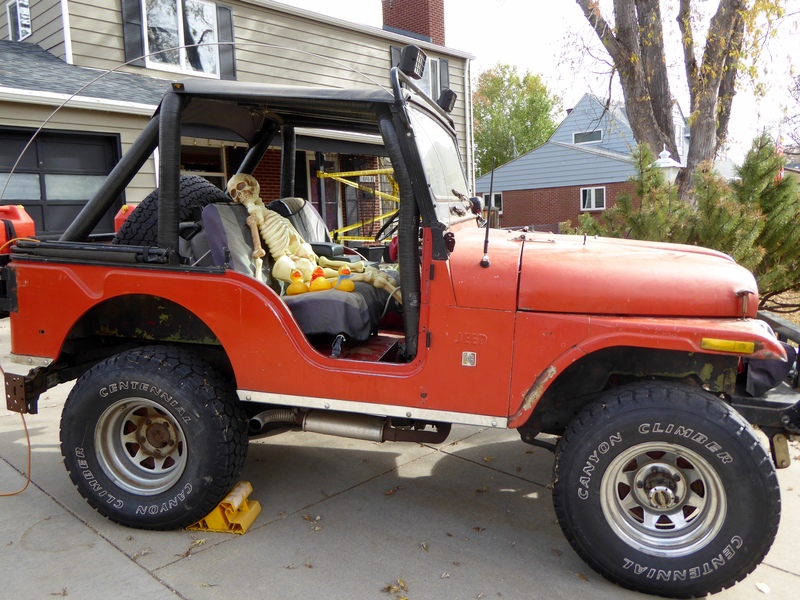 Not too scary, but certainly showing Halloween spirit. Some houses have a holiday display on the front porch. 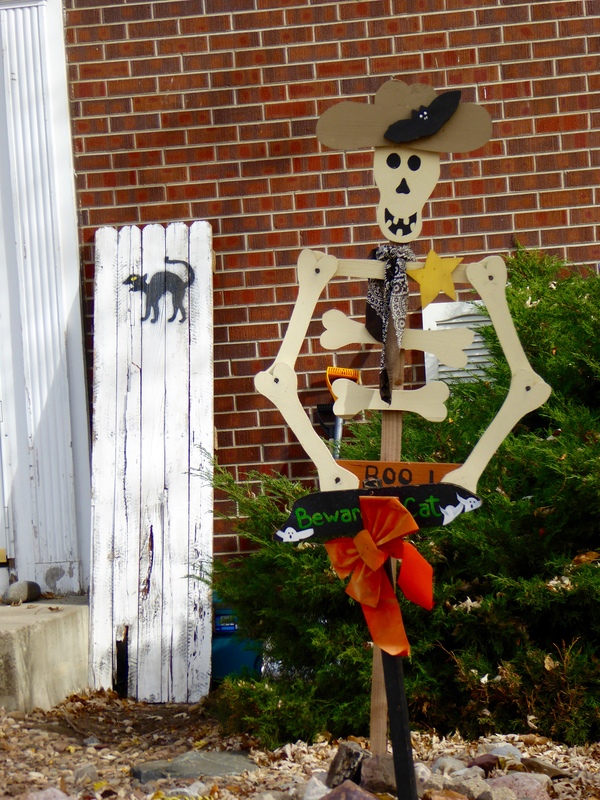 We were going to take a ride with this guy, but he looked a little too skinny to be riding. He might fall out of the Jeep. 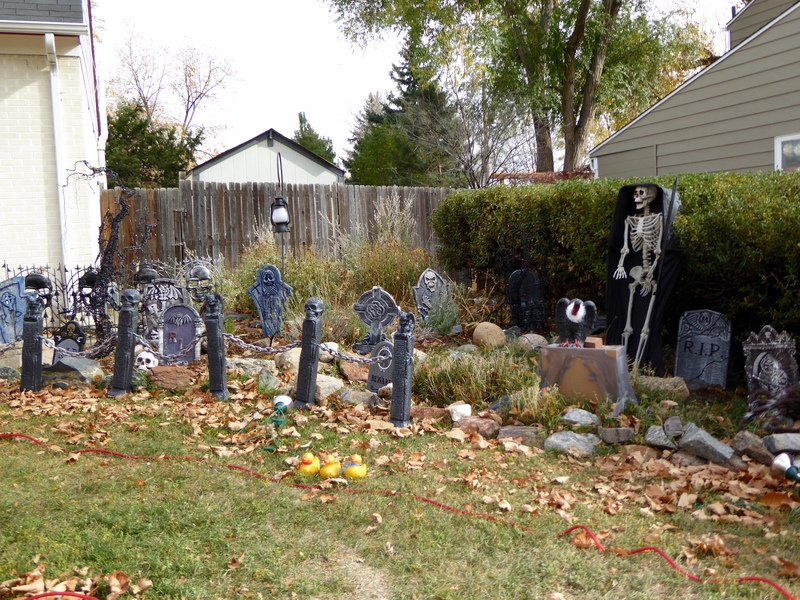 Another neighbor made a graveyard in the front yard. 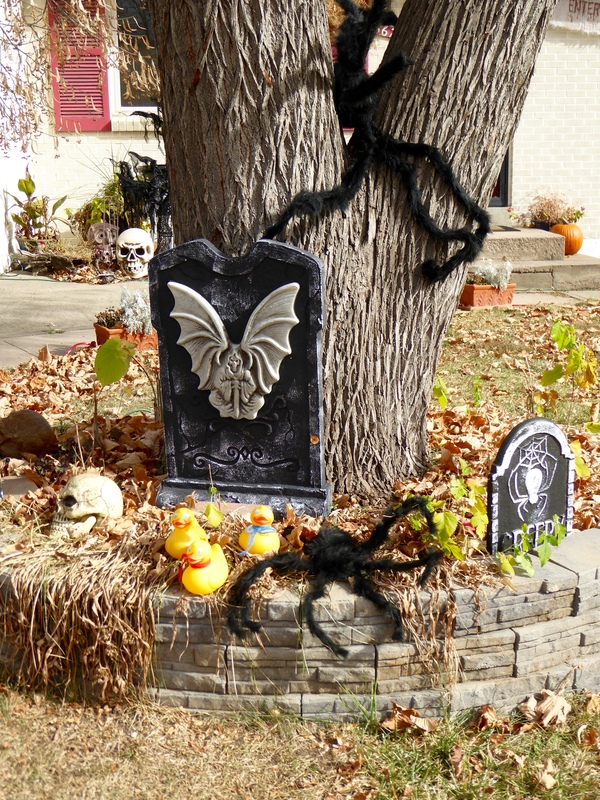 We ducks usually don’t look, talk and laugh in graveyards, but the humans said we could, this is Halloween. Are these friendly spiders? Giant spiders in the tree??? We think so. We are pretty close to one. 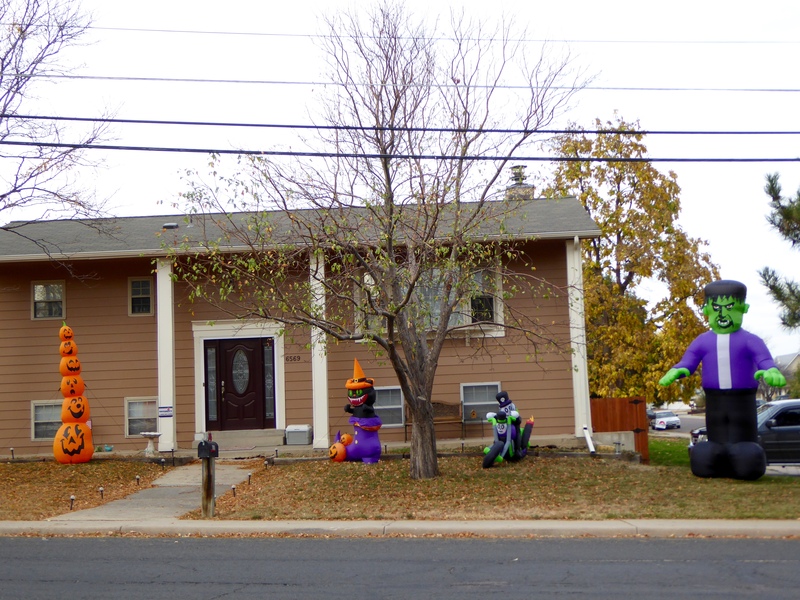 Even the tall guy on the right–the green and purple one, seems friendly, when the sun is shining. A friendly guy, he even has a cowboy hat on. We like him a lot. There is a day care in this house. They really have a lot of decorations. Even motorcycles. The next house, also part of the day care, has many things. 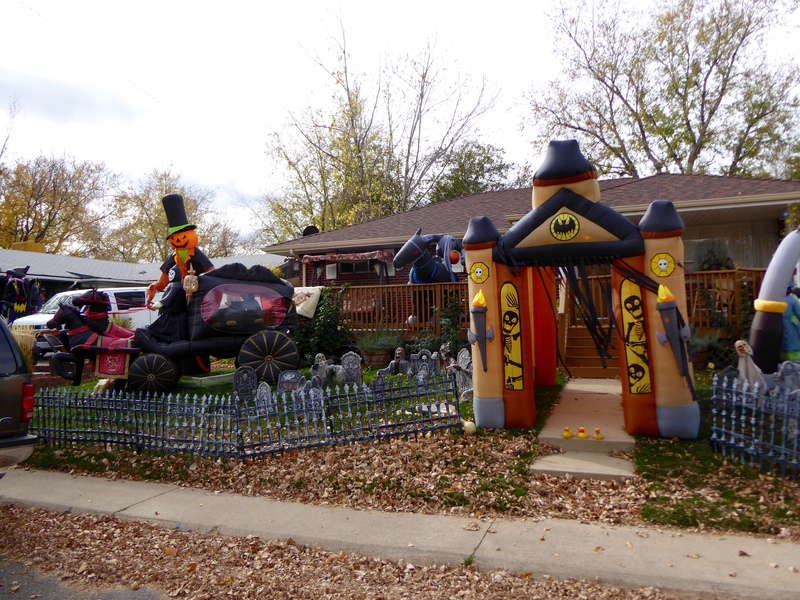 Tonight when children come trick or treating, they will walk through this arch to receive candy. They also have Dead End Cemetery here. Halloween is the night that children wear costumes and go from house to house saying “trick or treat”. 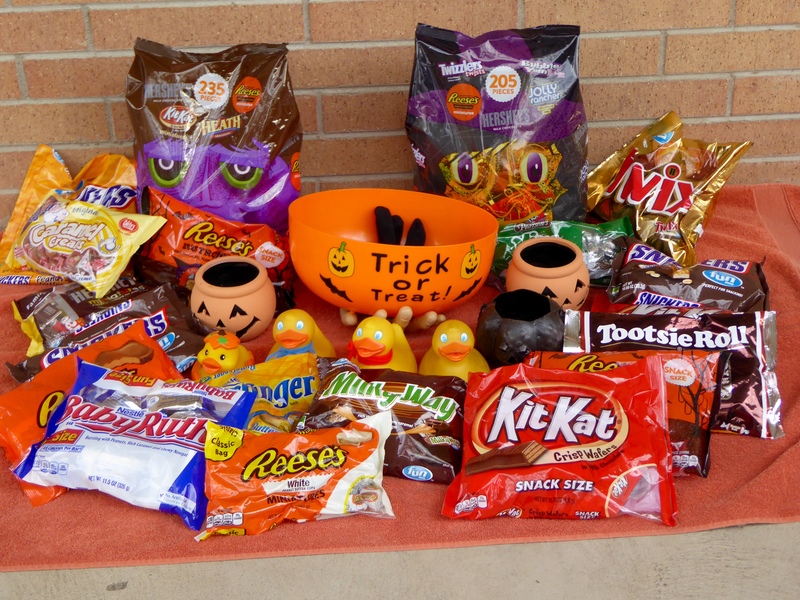 The people in the houses have purchased huge amounts of candy to give to the children tonight. Most young children are accompanied by adults. We ducks and humans really liked this house. There is so much here. 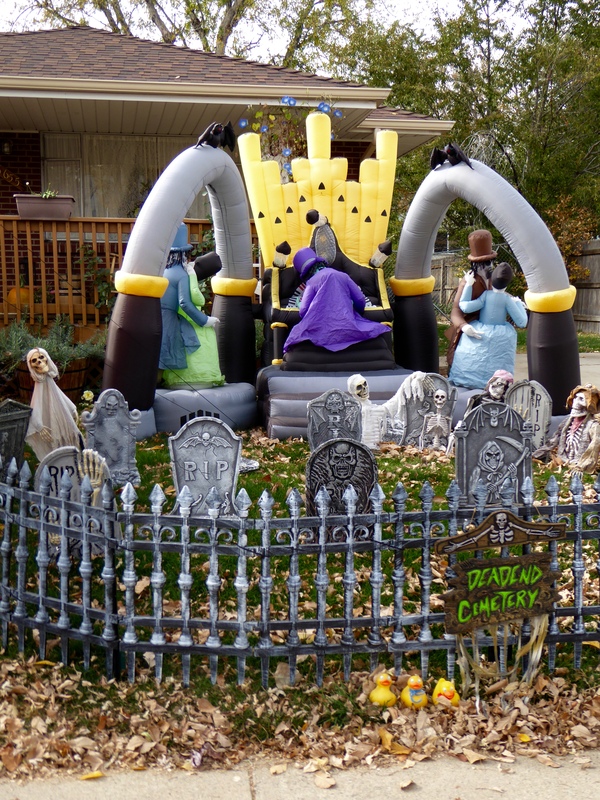 From another view, some old farm equipment has been used in the Halloween display. 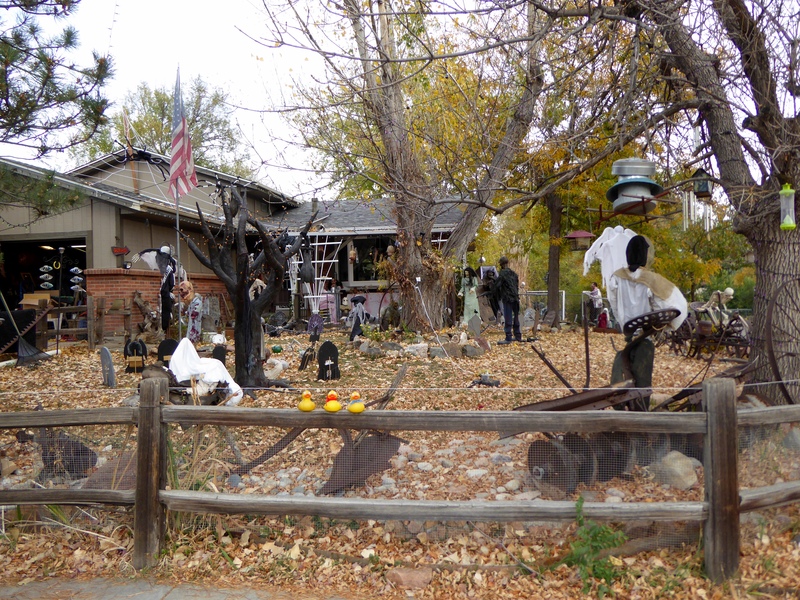 The weather in Denver has really been warm and beautiful, so many humans put a lot of time and work into the Halloween decorations this year. We appreciate all they have done and love looking at them. At our house, we are ready for many trick or treaters this year. The evening is forecast to be perfect for Halloween, so we expect many children. 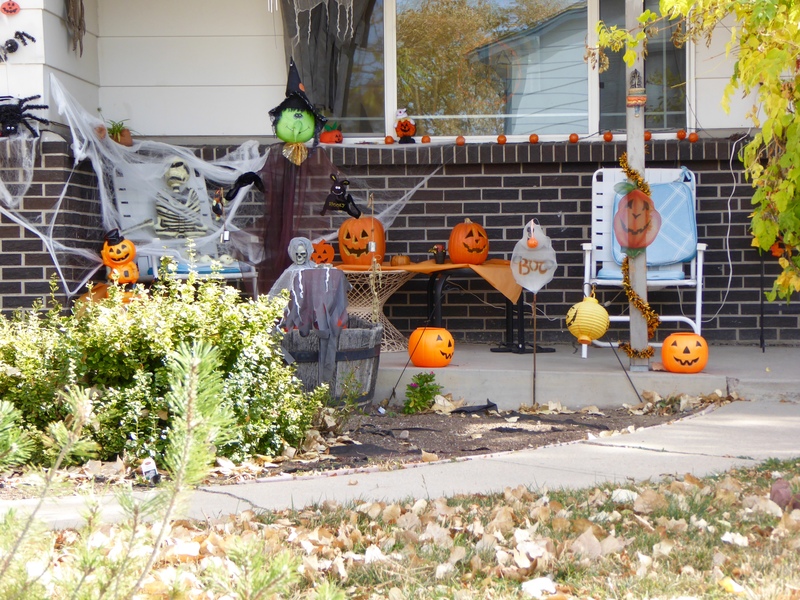 The humans usually sit on the front porch giving candy. There will be a crock pot of chili inside for our humans, friends and neighbors. 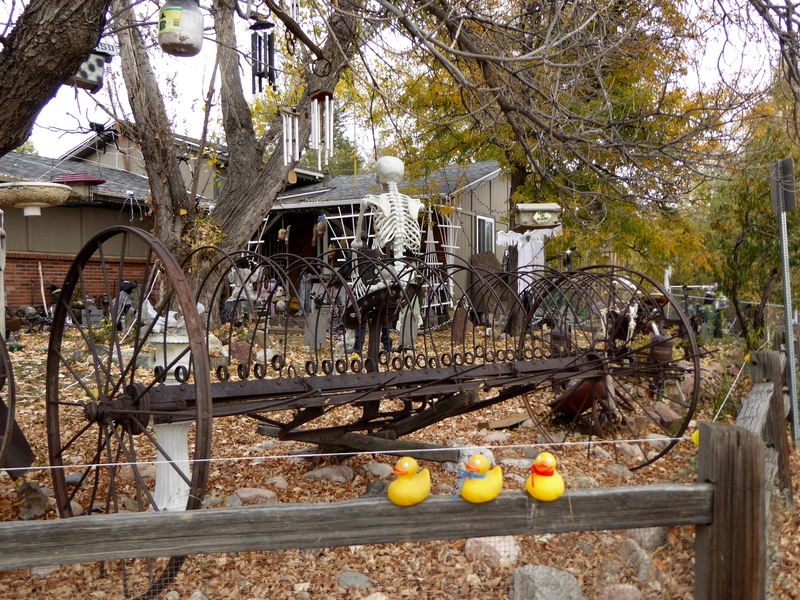 Happy Halloween to each of you from the Colorado Traveling Ducks and our humans. 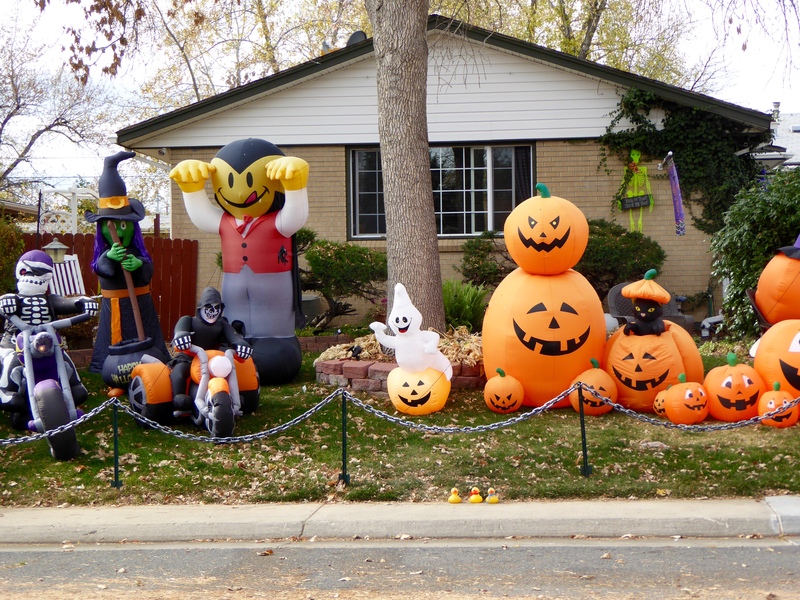 This entry was posted in Colorado, Holidays, Uncategorized and tagged Colorado Traveling Ducks, decorations, Happy Halloween. Bookmark the permalink. Is there such a thing as a friendly spider?? We can only hope. We do not like the live ones either. Thanks for reading and commenting.